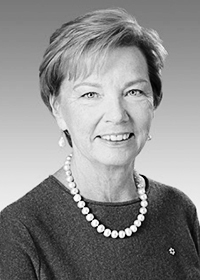 In a forty-year career that has seamlessly spanned private and public sector leadership roles, Carol Stevenson was a highly respected CEO, who played a critical part in restructuring the telecommunications industry; a visionary, who helped transform business education serving as Dean of the Ivey Business School at Western University from 2003-2013. Prior to joining Ivey, Carol spent 30 years in the telecommunications industry, advancing through a series of management positions to join the executive ranks of Bell Canada in 1988. From 1995 to 1998, as President and CEO of Stentor Resource Centre Inc., she led the national marketing and technology development centre for Canada’s nine telecommunications companies. Then, as President and CEO of Lucent Technologies Canada from 1999 to 2003, she spearheaded the team that succeeded in tripling Lucent’s market share in Canada despite an industry downturn. Carol, a Corporate Director, currently serves on the Boards of several leading companies. She is a Director of General Motors Company, Maple Leaf Foods Inc., and Intact Financial Services and Carol was Chair of the Ontario Research Fund Advisory Board and was also a member of the Board of Directors of the Vancouver Olympic Games Organizing Committee (VANOC). She currently serves on the Board of Governors of the Stratford Festival.